Tue., Aug. 21, 2018, 4:21 p.m. In 2013, the band formed in Ontario, Canada and includes James Barker (guitarist and lead vocalist), Connor Stephen, Taylor Abram, and Bobby Martin. They nabbed the Emerging Artist award from the Boots & Hearts Music Festival in 2015 and were on their way. After winning the 2018 Juno Award (that’s the Canadian Grammy) for Country Music Album of the Year with “Game On,” things have picked up for the group. In an email interview, Barker talks about getting the band together, forging a country band in Canada and dealing with success. Q: Tell me a little about the history of your band. How did you get together? A: Well, it’s not a super short answer. Connor and I met at band camp when we were both 16. We started up an alt rock band, and played together for a couple of years. When we were both about 18 we entered a Battle of the Bands (we came second place to a bunch of 60-year-olds) and the prize for coming second was a bunch of studio time in a local studio. Taylor was running said studio, so that’s where we met him. Connor went off to school in Oklahoma for two years, and I focused on my writing, spending my time between Toronto and Nashville. When Connor came back from school, we decided we wanted to start our own country band, Taylor was a perfect fit for what we wanted, and we actually met Bobby through a fifth member of the band who we played with for our first few shows. Bob was another perfect fit, and JBB was born! Q: Who are your inspirations? A: We all have pretty diverse inspirations. Whenever we’re road tripping to a gig in a rental van we just play radio roulette and let whatever sounds good on the radio play out. Some big ones are Led Zeppelin, Eric Church, George Strait, Kendrick Lamar, the Red Hot Chili Peppers, and Matchbox 20 to name a few. Q: The band is originally from Canada. What brought you to the US? A: When we first started the band, there was one thing we all had in common; we wanted to make music we were proud of, and not stop growing until we couldn’t grow anymore. The goal was always to make it in America, because it’s the home of country music. We have just been super blessed that it took off so fast in Canada! Q:What was it like to drop your first single? A: It was pretty freaky. I know they tell you that as a writer and an artist you’re supposed to be confident in your music, and we are, but I think it’s impossible to not be scared when you know that everything you’ve done in your life up to this point depends on the “success” of just one song. As a writer, you write songs every day, and it’s weird to me that one morning you could get up and eat your cereal, then go and write with your buddies, just like any other day. Flash forward six months, all the words that you collectively agreed made the most sense now hold your fate within them … freaky stuff. Q: What are the writing collaboration dynamics like? A: Writing music is hard. Anyone who says differently is wrong or lying. That’s actually not true, any person on the planet could write a song, and could probably do it in under 10 minutes, but writing a song you can be proud of is hard. Every line should fit, every word should fit, every syllable should fit, and when someone listens to it, they shouldn’t think that it was hard to write. Q: Do you write your lyrics? A: I’m really privileged to have written all the music we’ve ever released with a combination of the same four people (Todd Clark, Travis Wood, Gavin Slate and Donovan Woods). I’ve learned more in the last 3 years about music than I had in the 23 previous to that. All that to say, we all write the lyrics and all write the music, it’s a group effort that gets built as it goes, you work together and shouldn’t be worried about how many lines you contributed, just about how good the song turns out. Q: You’re from Canada; do any of you speak French? A: In Canada it’s mandatory to take French every year until grade 9, so we all know a little French, but not enough to hold a conversation I wouldn’t think. It’s actually something that we hadn’t noticed until that last couple of years, since we started playing shows in Quebec. French is definitely something I want to get better at, there’s something kind of embarrassing about being within your own country and not being able to speak one of the official languages. Q: Would you ever consider writing in French? Or is country music too ordered to English? A: I love the idea of being able to write in French, I know the Beatles had a couple songs where they switched between languages, I always thought that would be pretty cool. Really opens up the rhyming opportunities too! Based on our experience, I think country music could be in any language. It’s a relatable music, includes everyone, from anywhere and speaking any language. Q: What was it like to win the Juno award? A: It was a pretty amazing moment, definitely a career highlight so far. Awards are kind of bittersweet for artists because you’re excited to be there, excited to see all these other cool acts that you admire, but at the same time you’re dying inside just wishing they were over. 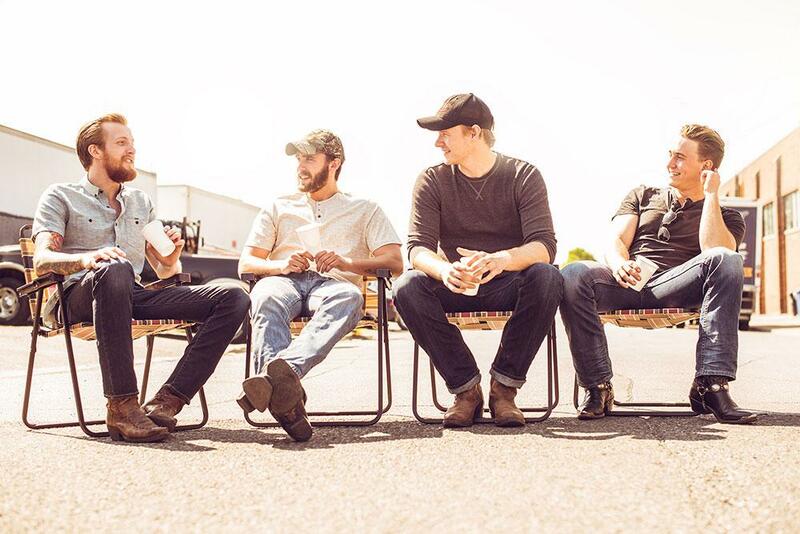 Q: Is the band excited to open for Randy Houser? A: We’re pumped to be opening up for him. The first concert we went to together as a band was him opening up for Dierks (Bentley), so it’s kind of come full circle in a strange way! Q: What has the preparation been like? A: I mean, we’re always on the road, so it’s hard to really even call it preparation anymore. We’ve basically been touring for a year and a half straight, so I think we’re pretty warmed up. Q: How did you decide what to perform? Does the type of venue influence your selection at all? A: It does for sure, some songs translate better in a club than they do outside, and vice versa. Q: Do you work with a set list or is it more improvisational? A: We usually make up our setlist about an hour before the show, and it pretty much changes each show. We have our songs that are always in the same place, the staples as you might call them, and then we have the ones that can be interchanged with one another. Canadian shows are different than American ones, and acoustic shows are different from electric ones. Q: Do you have a favorite song to perform? A: I would have to say that “Chills” is our favorite to perform, because people always go crazy, and because we really rock it up. It’s really fun musically. Q: What can people expect? A: We like to keep it diverse and keep it loose. We throw a few curveball covers, and some pretty fun crowd participation moments in there. That’s all I can say! Q: What would you say were the turning points in your journey so far? A: The major turning points so far are: deciding to start the band, winning the Emerging Artist contest, signing with Universal music and releasing our first single in America. I can honestly say that those four moments have set the course for our careers thus far. A: We’re working on new music right now, so we’re really hoping to have that out in the fall. Other than that, basically more of the same, playing the music we love for the people we love, and doing it every damn day. Q: You’ve released a single, “Good Together,” recently. Do you have an album in the works? A: We’ve discussed the possibility of a full-length album, but no hard plans right now. We basically just keep writing and releasing songs as they happen, it keeps things fresh. Published: Aug. 21, 2018, 4:21 p.m.